If you're on a mission for a casual yet stylish getup, make a light blue chambray long sleeve shirt and Bonobos weekday warriors non iron tailored cotton chinos your outfit choice. Both pieces are totally comfortable and will look great together. Make white leather low top sneakers your footwear choice to make the ensemble more current. 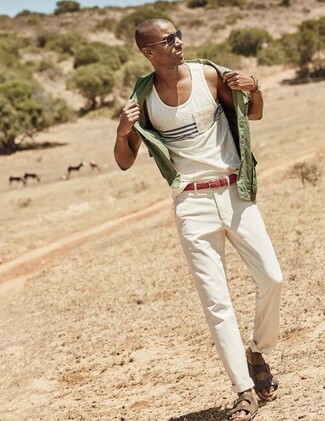 Rock a white tank with beige chinos to be both neat and relaxed. 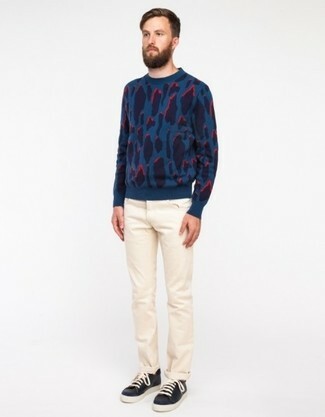 If you're looking for a casual yet dapper outfit, make a navy leopard crew-neck sweater and beige chinos your outfit choice. Both pieces are totally comfortable and will look great paired together. Complement this look with navy leather low top sneakers. If you're on the lookout for a casual yet stylish ensemble, choose a navy and white horizontal striped crew-neck t-shirt and Bonobos weekday warriors non iron tailored cotton chinos. Both garments are totally comfortable and will look great together. Choose a pair of beige suede driving shoes to show your sartorial savvy. Contrary to what you might believe, being a dapper dude doesn't require that much effort. 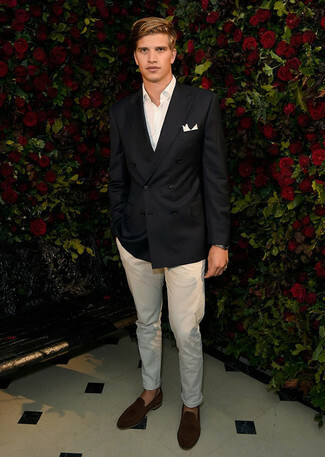 Just opt for a black double breasted blazer and Bonobos weekday warriors non iron tailored cotton chinos from Nordstrom and you'll look awesome. 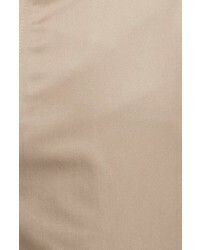 Dark brown suede loafers will contrast beautifully against the rest of the look. 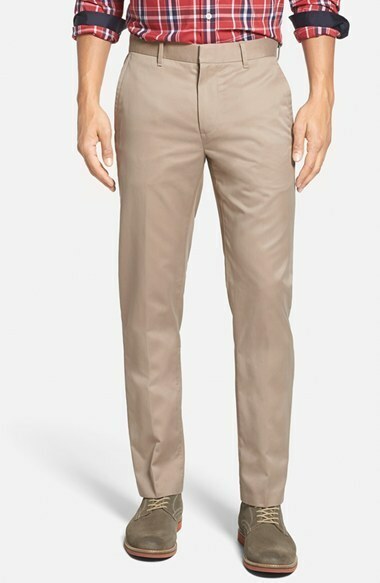 If you're on the lookout for a casual yet dapper ensemble, opt for a white hoodie and Bonobos weekday warriors non iron tailored cotton chinos from Nordstrom. Both garments are totally comfortable and will look great together. Look at how well this getup is complemented with white leather low top sneakers. 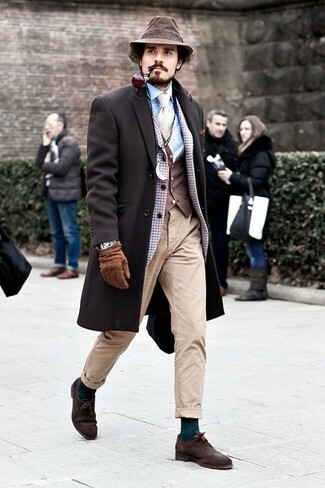 Consider wearing a dark brown overcoat and beige chinos if you want to look on-trend without too much effort. Got bored with this outfit? Enter dark brown suede oxford shoes to spice things up. 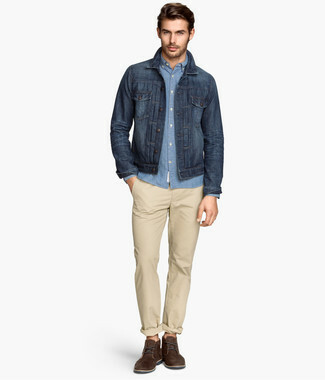 If you're scouting for a casual yet stylish getup, rock a navy denim jacket with beige chinos. Both pieces are totally comfortable and will look great together. Kick up the cool of your ensemble by finishing off with dark brown suede derby shoes. 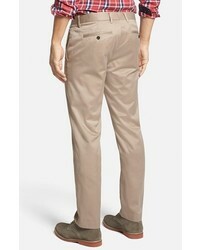 If you're scouting for a casual yet sharp getup, opt for an olive long sleeve shirt and beige chinos. Both items are totally comfortable and will look great together. For something more on the daring side to round off this outfit, go for a pair of dark brown leather sandals.